This article is about the current championship. For the historical championship, see WWE Cruiserweight Championship (1991–2007). The Cruiserweight Classic was a WWE Network series and tournament for cruiserweights. Tournament qualifying matches took place in various promotions of the independent circuit, including well known promotions such as Revolution Pro Wrestling, Progress Wrestling, and Evolve. 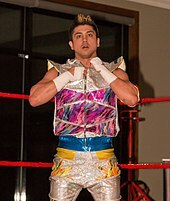 Many cruiserweight wrestlers from around the world were given the chance to qualify for the 32-man tournament, which took place over four dates: June 23, July 13, August 26, and September 14, 2016. The final of the Cruiserweight Classic came down to T.J. Perkins and Gran Metalik. Before the final match, Triple H revealed that the winner would not only receive a trophy, but would also become WWE Cruiserweight Champion for the new cruiserweight division on the Raw brand. Perkins defeated Metalik to become the inaugural champion. Like the WWE Championship's side plates, the Cruiserweight title's side plates include removable round sections, allowing the holder's personal logo to be added to the championship belt; the default sections show silver and purple world maps with the WWE logo over them. During Neville's first reign, the color of the slash under the WWE logo on the center plate and default side plates were changed from purple to orange.. Originally, the championship was defended exclusively on Monday Night Raw. On November 29, 2016, a cruiserweight-exclusive show on the WWE Network premiered called 205 Live. On the premiere episode, Rich Swann defeated The Brian Kendrick for the championship. The title then became defended on both Raw and 205 Live. In early 2018, Triple H was given creative control over 205 Live, as he has with the NXT brand, and began restructuring the show. Following WrestleMania 34, 205 Live became its own brand where the title is exclusively defended. After then-champion Enzo Amore was released from WWE on January 23, 2018, and the title was vacated, it was announced that a general manager would be appointed for 205 Live and would address the championship. On the January 30 episode of 205 Live, Drake Maverick (formerly known as Rockstar Spud in Impact Wrestling) was appointed as the 205 Live General Manager. Maverick announced that there would be a 16-man single elimination tournament to crown a new WWE Cruiserweight Champion, with the finals to occur on the WrestleMania 34 pre-show. The tournament came down to Cedric Alexander and Mustafa Ali where Alexander defeated Ali to win the vacant championship. As of April 20, 2019, there have been eleven reigns between nine champions and one vacancy. The inaugural champion was T.J. Perkins. The oldest champion is The Brian Kendrick, winning the title at 37 years old, while the youngest champion is Rich Swann when he won it at 25. Neville and Enzo Amore have the most reigns at two. Neville also has the longest reign at 197 days (196 days as recognized by WWE), while Akira Tozawa has the shortest reign at 6 days (5 days as recognized by WWE). Neville also has the longest combined reign at 232 days (231 days as recognized by WWE). Tony Nese is the current champion in his first reign. He won the title on April 7, 2019 in East Rutherford, New Jersey on the WrestleMania 35 pre-show by defeating Buddy Murphy. ^ McMahon, Vince (November 30, 2016). "Vince McMahon on Twitter". Twitter. Retrieved December 12, 2016. ^ a b Casey, Connor (June 29, 2018). "Here's Why the 205 Live Roster Is No Longer on Monday Night Raw". ComicBook.com. Retrieved October 22, 2018. ^ "WWE Cruiserweight Championship". WWE.com. ^ "WWE Network adds Global Cruiserweight Series to robust 2016 programming slate". wwe.com. Retrieved May 8, 2016. ^ "WWE Cruiserweight Classic tickets available starting Friday, May 20". WWE. Retrieved 2016-05-17. ^ "WWE Cruiserweight Classic: TJ Perkins becomes Raw's first WWE Cruiserweight Champion". WWE. Retrieved September 14, 2016. ^ a b c d Caldwell, James. "9/14 WWE Cruiserweight Tourney Finals – Caldwell's Complete Live Report". Pro Wrestling Torch. Retrieved September 14, 2016. ^ Hausman, Nick (December 21, 2016). "Rich Swann Gets Custom Plates On Cruiserweight Title (Video), Bubba Ray Hosting RAW Party In Freehold, NJ". Wrestle Zone. Retrieved December 24, 2016. ^ Namako, Jason. "WWE 205 Live Results – 11/29/16 (Rich Swann wins the WWE Cruiserweight Championship on the premiere episode)". WreslteView. Retrieved November 29, 2016. ^ "Daniel Bryan addresses the state of WWE 205 Live". WWE. Retrieved February 2, 2018. ^ a b c d Caldwell, James (2016-07-20). "7/20 WWE Cruiserweight Results – Caldwell's Week 2 Report on Akira Tozawa, Tajiri, TJP, excellent Dorado vs. Ali match". Pro Wrestling Torch. Retrieved 2016-07-21. ^ a b c d Caldwell, James (2016-08-03). "8/3 WWE Cruiserweight Tournament Results – Caldwell's Report on Week 4 to conclude First Round, including Gargano vs. Ciampa". Pro Wrestling Torch. Retrieved 2016-08-04. ^ a b c d Caldwell, James (2016-07-13). "7/13 WWE Cruiserweight Results – Caldwell's Week 1 Report on Ibushi, Cedric Alexander, more". Pro Wrestling Torch. Retrieved 2016-07-14. ^ a b c d Caldwell, James (2016-07-27). "7/27 WWE Cruiserweight Results – Caldwell's Week 3 Report on Zack Sabre, Brian Kendrick, more in action". Pro Wrestling Torch. Retrieved 2016-07-28. ^ a b c Caldwell, James (2016-08-17). "8/17 WWE Cruiserweight Results – Caldwell's Report on stellar Kendrick vs. Nese and Gallagher vs. Tozawa Sweet 16 matches". Pro Wrestling Torch. Retrieved 2016-08-18. ^ a b Caldwell, James (2016-08-10). "8/10 WWE Cruiserweight Tournament Results – Caldwell's Report on Ibushi vs. Alexander classic, Tajiri vs. Metalik in Sweet 16". Pro Wrestling Torch. Retrieved 2016-08-11. ^ a b c Caldwell, James (2016-08-24). "8/24 WWE Cruiserweight Tournament Week 7 – Caldwell's Report on Gargano vs. TJP, Sabre vs. Gulak, Swann vs. Dorado to finish Sweet 16". Pro Wrestling Torch. Retrieved 2016-08-24. ^ a b Caldwell, James (2016-08-31). "8/31 WWE Cruiserweight Tournament Week 8 – Caldwell's Report on Ibushi vs. Kendrick, Tozawa vs. Metalik Elite 8 matches". Pro Wrestling Torch. Retrieved 2016-08-31. ^ a b Caldwell, James (2016-09-07). "9/7 WWE Cruiserweight Tournament – Caldwell's Report on Sabre vs. Dar, Swann vs. Perkins to conclude Elite 8 Round". Pro Wrestling Torch. Retrieved 2016-09-08.